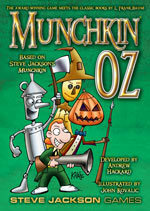 Want to know more about Munchkin Oz? 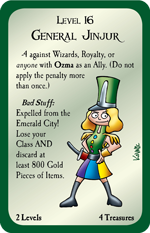 Check out the Munchkin Oz Designer's Notes written by Munchkin Czar Andrew Hackard. Find out how Andrew took inspiration from the 14 original Oz books by L. Frank Baum and wrote some new content for the game . . . learn all behind-the-scenes details behind the General Jinjur card and so much more, in the Designer's Notes! If you missed the thoughts of Munchkin Oz illustrator John Kovalic, check out his post on the Daily Illuminator. Create your own adventure – pick up Munchkin Oz, available only at Target!